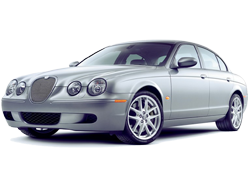 When Jaguar released the S-Type in 1999, they had their sights firmly set on mid-sized luxury cars like the BMW 5-Series and Mercedes E-class, providing the same sporting character together with the high level interiors that had made them famous. First sold with V6 and V8 engines, a supercharged "R" version was soon added, delivering acceleration that would be respectable for a high end sports car, let alone a luxury sedan. The car got a minor refresh in 2005, then was built alongside its replacement, the XF, for two years before production ended in 2009.